I’ve recently been researching landslide triggers in Tasmania. Events which trigger landslides include unusually heavy rainfall events, and earthquakes. 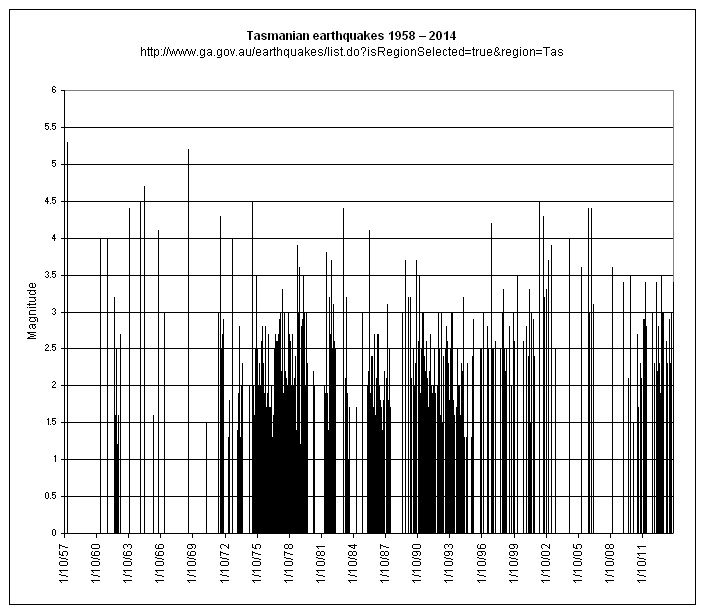 Here’s a graph of some 860 earthquakes and their magnitudes recorded in the Tasmanian region over the period 1958 – 2014. It’s a picture of quiet earthquake periods lasting several years interrupted by years of much more intense activity. The information is freely available on the Geoscience Australia website. Click on the Google Earth file – satellite image of distribution of earthquakes in Tasmania. Depending on your browser, this will download the file or instantly open it in Google Earth. In the former case, you’ll need to locate the file in your file manager and then open it in Google Earth. Left-clicking on an earthquake symbol on the satellite image provides more detailed information. A very similar map of earthquake epicentres in the Tasmanian region appears in the beautifully comprehensive Geological Evolution of Tasmania (2014) published by the Tasmanian Division of the Geological Society of Australia. Information about earthquake magnitudes is summarised in the two tables following. (The estimated number of earthquakes each year in the first table is the worldwide number.) The Tasmanian earthquakes range in magnitude class from (less than) Minor to Light, with two quakes (in January 1958 and May 1969) of magnitudes 5.3 and 5.2 respectively edging into the Moderate class. Earthquake activity not shown on the graph and map included many small and some large quakes in northeastern Tasmania during 1883 – 1885. Earthquakes are also classified in categories ranging from minor to great, depending on their magnitude.